The Barbie chairs have been evolving for a few weeks now. 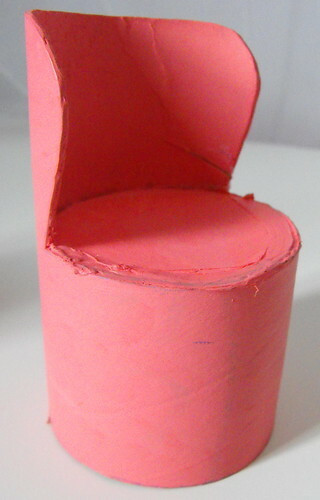 From my initial idea that came from recycling a mailing tube, to being a shade of pink that didn't really agree with me. They are now a very groovy textured gold. Here's what I did. I sketched the shape onto the tube. After I was happy with it, I cut it out. 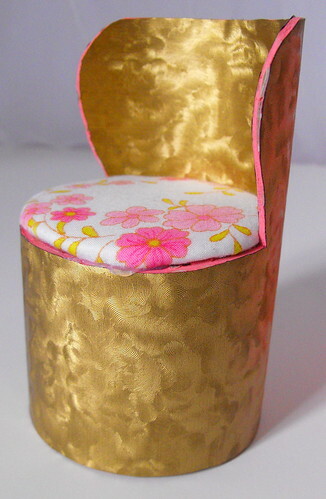 I sized up how high to make the chairs by measuring up Barbie sitting on something. My chairs are about 4 inches tall. 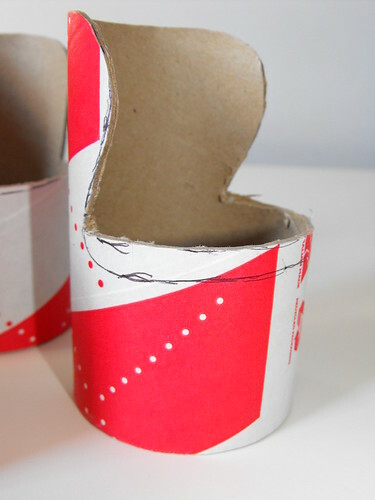 Then I traced around the chair shape to make a template for all the other chairs. I used some scrap photo mat board to make disks and hot glued them into the top opening. To make the cushions I used some disks of board as well and made them up in the same way as I made my fabric name badges. I ended up using self adhesive contact to cover the chairs when the painting thing didn't really work out for me. I put the contact on and then trimmed off the excess with a craft blade. Finally, I hot glued the cushions on. 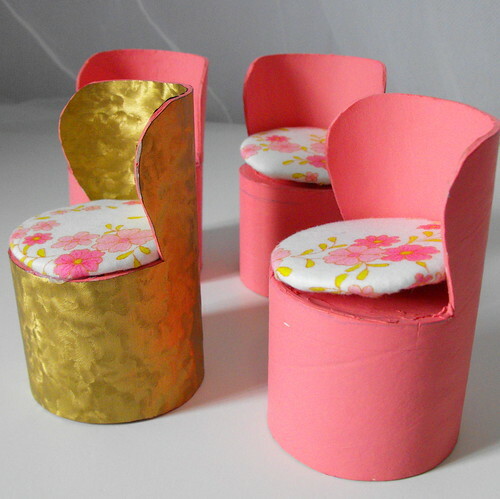 These took me back to the days when my sister & I made Barbie chairs out of tp tubes! These are wonderful! Hi Glenyce, these are great! I just love projects with recycled items and am going to place a link to this on my weekly international blog linking party. I hope you'll come next week or sometime soon and link to something new, we (an interesting group of crafters from around the world) would love to have you! Hi, I'm Glenyce, welcome to my mid-craft crisis. I am married to Tim and Mummy to our 3 girls, Esther, Ellamay and Amelia. This is a collection of things I am in the middle of.